The days when you could simply grow a basil plant from a seed by placing it on your windowsill and watering it regularly are gone — there’s no point now that machine learning-optimized hydroponic “cyber-agriculture” has produced a superior plant with more robust flavors. The future of pesto is here. This research didn’t come out of a desire to improve sauces, however. It’s a study from MIT’s Media Lab and the University of Texas at Austin aimed at understanding how to both improve and automate farming. In the study, published today in PLOS ONE, the question being asked was whether a growing environment could find and execute a growing strategy that resulted in a given goal — in this case, basil with stronger flavors. Such a task is one with numerous variables to modify — soil type, plant characteristics, watering frequency and volume, lighting and so on — and a measurable outcome: concentration of flavor-producing molecules. That means it’s a natural fit for a machine learning model, which from that variety of inputs can make a prediction as to which will produce the best output. “We’re really interested in building networked tools that can take a plant’s experience, its phenotype, the set of stresses it encounters, and its genetics, and digitize that to allow us to understand the plant-environment interaction,” explained MIT’s Caleb Harper in a news release. The better you understand those interactions, the better you can design the plant’s lifecycle, perhaps increasing yield, improving flavor or reducing waste. 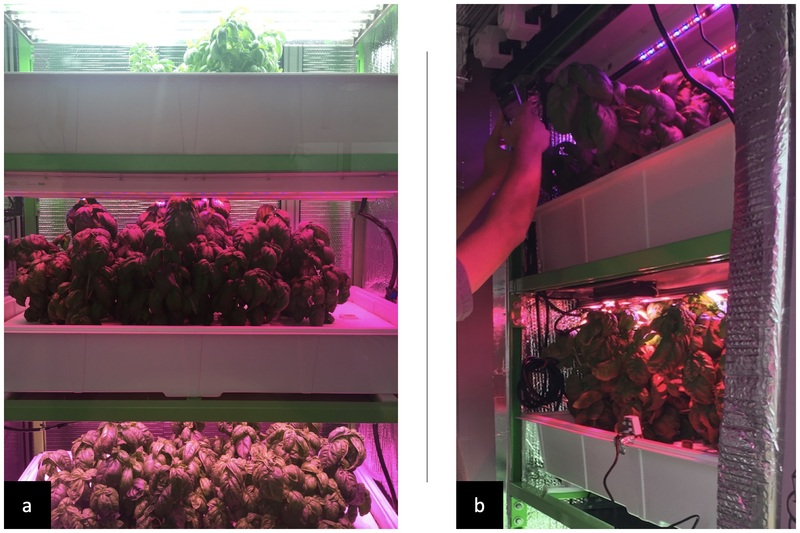 In this case the team limited the machine learning model to analyzing and switching up the type and duration of light experienced by the plants, with the goal of increasing flavor concentration. A first round of nine plants had light regimens designed by hand based on prior knowledge of what basil generally likes. The plants were harvested and analyzed. Then a simple model was used to make similar but slightly tweaked regimens that took the results of the first round into account. Then a third, more sophisticated model was created from the data and given significantly more leeway in its ability to recommend changes to the environment. To the researchers’ surprise, the model recommended a highly extreme measure: Keep the plant’s UV lights on 24/7. Naturally this isn’t how basil grows in the wild, since, as you may know, there are few places where the sun shines all day long and all night strong. And the arctic and antarctic, while fascinating ecosystems, aren’t known for their flavorful herbs and spices. Nevertheless, the “recipe” of keeping the lights on was followed (it was an experiment, after all), and incredibly, this produced a massive increase in flavor molecules, doubling the amount found in control plants. But while a more flavorful basil is a welcome result, it’s not really the point. The team is more happy that the method yielded good data, validating the platform and software they used. If we’re going to feed the world, it’s not going to be done with amber waves of grain, i.e. with traditional farming methods. Vertical, hydroponic, computer-optimized — we’ll need all these advances and more to bring food production into the 21st century.